Unify is our out-of-the-box marketing solution, developed to help businesses connect with customers personally, on time and with the correct information. Our system connects your most up-to-date marketing assets to your sales teams via ‘the cloud’. Your marketing department can simply upload PDF documents within Unify, which allows users to pick and mix the information they require to deliver tailored, personalised marketing to specific audiences. Bound together with a custom personalised cover for each individual client, Unify helps you create impact by sending relevant and compelling documents every time. Sales teams can respond faster with relevance and impact to win more business. They can create and send personalised sales documents and proposals from any web-enabled device. Unify increases the value you get from your marketing spend by reusing existing assets, which dynamically improves sales performance and promotes a consistent brand image. Unify adapts to suit your individual company requirements. As well as enabling you to input general contact information, such as name, address and date, you can also personalise documents with other information relevant to your business to generate something unique and personal. Having all your marketing material (e.g. brochures, leaflets, product sheets, etc) online and accessible, gives you and your team the ability to select and create something unique and relevant for each client. With a simple search and check box function, it’s quick and easy for anyone in your team to find exactly what is required. The result? A huge saving in time and money. 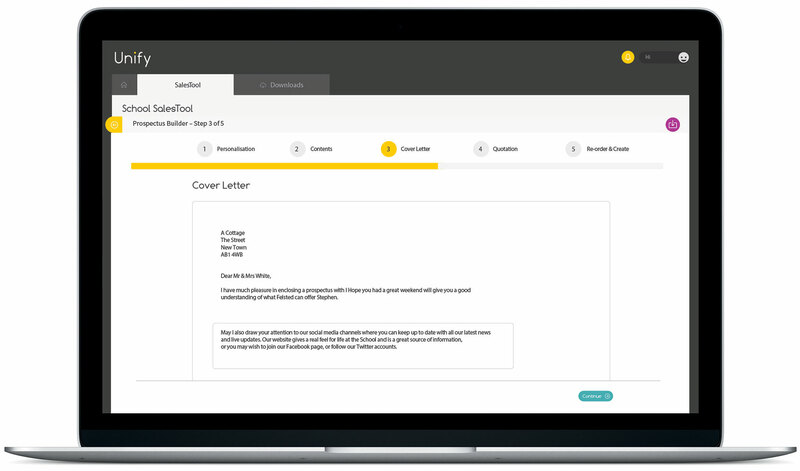 Unify gives you full control so that every word on a covering letter can be set and locked, making sure that everything is always on brand and consistent (no more embarrassing spelling errors). However, there’s an option to allow anyone on your team to add an additional paragraph, allowing for that personal touch in every letter. Configure Unify to produce a quotation for your specific requirements. With comprehensive control of currency, tax, discounts and more, it’s simple to add line-by-line products or services to create a tailored quote. Unify can also be set up to automatically pull details and prices linked from choices made in step 2. Once you have selected all the pages you require, Unify gives you the option to re-order them to suit your preference. Alternatively, if your company sales process requires that the pages of a proposal are always in an agreed order, this can be set within the preferences. Then with the press of a button, your personalised brochure will be created using the most up-to-date and relevant content stored in your Unify online library. Your brochure will be available to download as a PDF for you to send on to the client. 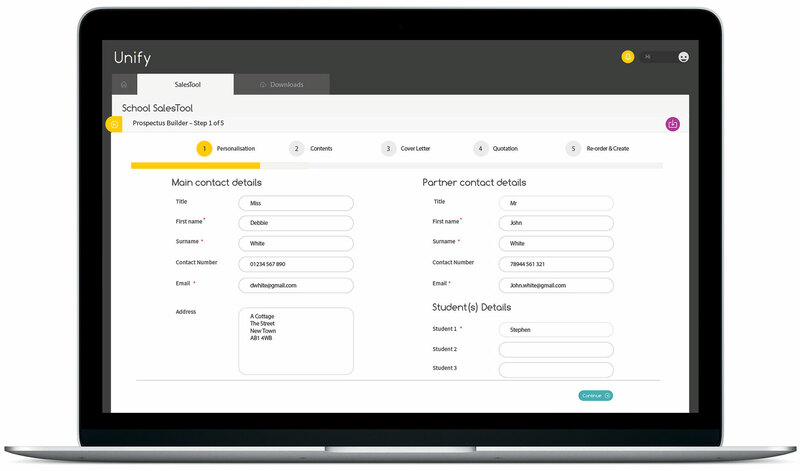 Every ‘new business’ contact is saved in Unify for future reference. If a user wants to make a change, it only takes a few clicks to update the details and create a new brochure. Unify offers a unique print-on-demand option. You can now save money by printing and storing fewer copies of generic marketing brochures, as it’s more cost-effective to print a ‘one off’ personalised, bespoke brochure as and when needed. 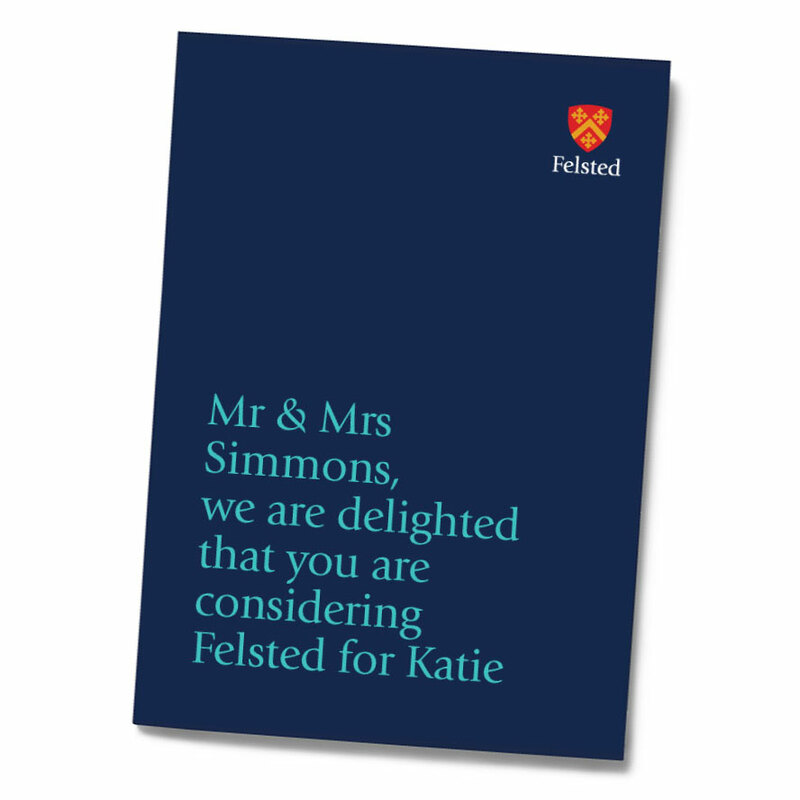 With their new prospectus, Felsted wanted to find a way to encapsulate the individuality and personality that every student brings to Felsted. The customer experience is essential at Hanbury Manor, getting it right first time is where it begins, by ensuring all sales associates are focused on the customer – identifying their needs.